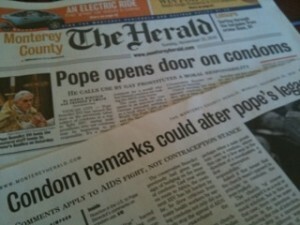 Home / 2010 / November / 21 / Pope approves condoms … thru the back door? What door are they alluding to? The back door of course. Well from behind or not, whether done by men or women, I’m glad the Catholic church is finally getting around to prevention, of both unintended lives and death. I wish it were’nt stated so obliquely in the name of HIV/AIDS … but it’s about time a global leader on his level gave permission for clerics of all kinds to honor all paths leading to not only dis-ease, but expressions of love and life! My former Catholic self says ‘hip hip hooray!’ Keep the double entendre’ headlines be they created innocently or not, continue!